This is a extended repost of a blog written with Jasper Simons for Critcom, the blog of the Council of European Studies. If one were to believe the assessments of European institutions, Portugal is on the path to recover from the severe economic crisis it suffered from 2010 onwards, and the drastic reforms implemented in employment protection, unemployment benefits and collective bargaining are starting to yield results. Portugal swiftly implemented most of the measures contained in the Memorandum of Understanding (MoU) agreed with the Troika. Since then, exports have gone up, debt accumulation slowed down and unemployment decreased as well. However labour market restructuring came with a high price tag, and the apparently promising numbers hide somewhat less encouraging developments for the long-term recovery of the country. The imposed changes to its political economy have not only led to a considerable deterioration of social protection, but they also coincided with high levels of emigration. The labour force has shrunk, and an impending demographic problem will be very difficult to reverse. With Portugal’s fiscal position worsening, the government quickly turned to spending cuts and deregulation reforms geared towards reassuring markets. These programmes could not prevent bankruptcy, however, and Portugal was forced to request a 79 billion euro bailout with even more severe austerity and flexibilisation policies attached. The MoU included, inter alia, the revision of the labour code and severe reductions in severance and overtime payments, measures increasing the scope for the individualisation of contracts and dismissals and lowering and restricting access to unemployment benefits, which the centre-right Passos Coelho government (June 2011-November 2015) implemented. Firstly, employment protection and severance payments (of fixed-term contract workers) have been severely affected. Although Portugal still has relatively high protection levels in the European context (and had one of the highest levels in the run-up to the crisis), no other European country has witnessed such a strong liberalisation trajectory since the crisis (see Figure 2). Alongside the flexibilisation of dismissals, minimum severance payment requirements for employers were lowered. For instance, severance pay in case of a redundancy dismissal for a worker with five years of tenure dropped from 21.7 to 14.3 weeks between 2010 and 2013. The minimum wage was frozen at 485 euros/month from 2011 onwards (565 with Christmas bonuses), until the new left-wing coalition that came to power in 2016 increased it again. Secondly, unemployment benefits were cut and eligibility requirements tightened reducing overall benefit. If unemployment did not decrease until recently, the share of people receiving benefits did decrease right when the government needed to cut expenditure. Coverage for both social and the ordinary unemployment benefits decreased: if high unemployment levels in Southern Europe often make the headlines, it is seldom mentioned that the actual number of unemployed people who receive benefits is much lower, and Southern Europe has had a rather poor record in this respect. Interestingly, if unemployment levels have decreased, this may have as much to do with the shrinking of the labour force as with the creation of jobs: between 2008 and 2014, the labour force (people in employment or seeking work) has shrunk by 303.000 people. If the number of jobs remains stable but the labor force decreases, unemployment goes down. This partly results from discouragement of workers, but also to a large extent from emigration. In fact, emigration may have had a greater impact because, as the government admitted, the number might be twice as high as official figures display. The Portuguese population has been shrinking since the crisis, and emigration added to an impending demographic problem, with the lowest fertility rates in the EU (1.23 children per woman) (Figure 3). Alexandre Afonso is an Assistant Professor at the University of Leiden, Netherlands. Jasper Simons is a political economy graduate and former European Economic and Social Committee trainee. This entry was posted in Austerity, Eurozone Crisis, Portugal, Uncategorized, Welfare and tagged Austerity, European Union, labour, Portugal, Welfare on May 19, 2016 by alexandre afonso. How did David Cameron manage to win the 2015 elections in spite of austerity? How can we explain the Conservative victory in last week’s British elections in the context of the austerity measures the Tories have been pushing through since they came to office? Indeed, even if the deficit hasn’t come down near the levels announced by the Coalition, there have been net cuts in social spending since it came to power. Political economy theories usually argue that voters sanction governmnets who cut social benefits. Building on the good ratings for economic competence attributed to the Tories in opinion polls, “austerians” have been trumpeting that this is a vindication of the austerity agenda. The storyline is that austerity works for everyone, unemployment is down, and this is why the Conservative party has triumphed in the polls. However, there is clear evidence that not everybody has been better off under the Coalition austerity plans. These plans have had distinct distributional effects: the poorest households have been hit the hardest, while middle-and higher income households have come out relatively unscathed. This victory is interesting because the common wisdom until recently was that politicians would systematically avoid cuts in public spending that would challenge their electoral prospects. This is especially important for welfare programs since the path-breaking analysis of Paul Pierson: people like social programs they are entitled to, and getting rid of them loses votes for incumbents. However, cuts in public spending didn’t hamper the electoral score of the Tories here, and I think this is due to the setup of the British welfare state and the composition of the Tory electorate. In a nutshell, low-incomes that paid the price for welfare cuts don’t vote, and especially don’t vote Tory, while those on higher incomes for whom lower taxes are more important do vote. After the poll debacle of the election, it appears that it wasn’t “Shy Tories” that were the decisive factor, but potential Labour supporters not bothering to vote. In the graph below, I have put together two measures: the share of net income coming from the state (from here; negative values mean transfers to the state as a share of net income), and the likelihood to vote in the general elections from the British Election Study by income quintile. 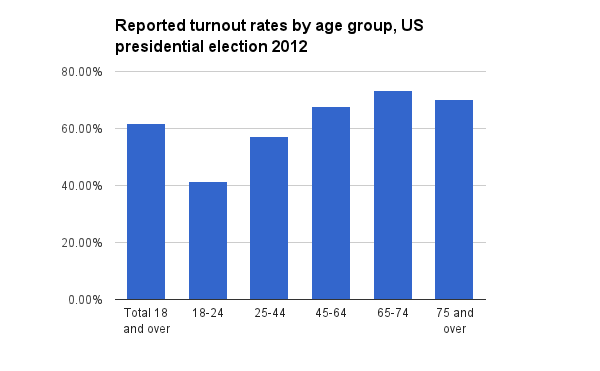 The latter is not a very good measure because people systematically lie when they say whether they’re going to vote. However, it reports the difference to the average across quintiles on a scale from from 1 to 5. What the graph shows is that people who receive most of their income from the state via social transfers (and who are the most likely to be hit by austerity cuts) are also those that are the least likely to go and vote. By contrast, those who are net contributors to the public budget – and have an interest in cuts to get lower taxes – are those that are the most likely to vote. 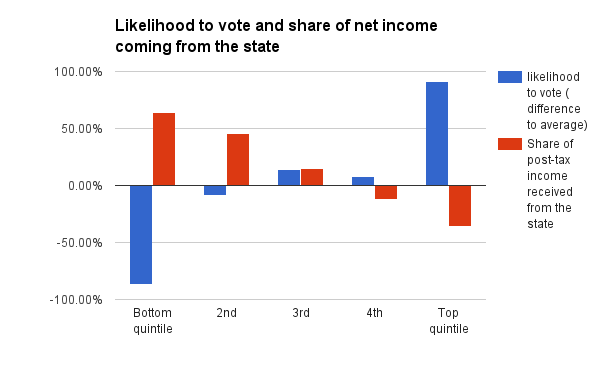 As I argued elsewhere, higher income quintiles are also much more likely to vote Tory. Hence, austerity could be pursued while limiting a potential backlash because it harms those that don’t vote, and rewards those who do. 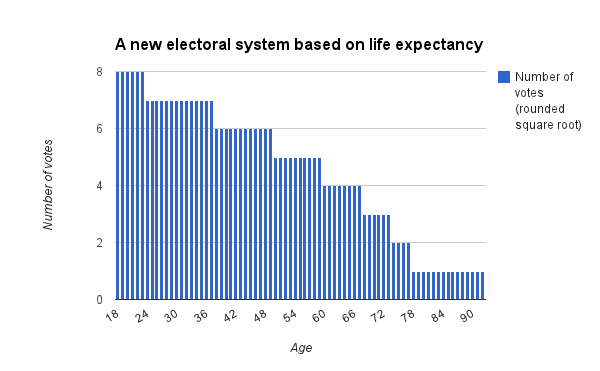 Besides this structural tendency observed about everywhere (the poor are much less likely to vote than the rich), this is also connected to some specificities of the British welfare state that make it easier for Conservative governments to retrench social programs without facing electoral sanctions. Because social programs are strongly targeted at the poor via means-testing and flat rates, the middle class basically doesn’t have an interest in welfare. The drop between middle class wages and benefits is simply too large for this group to consider it a valuable safety net. 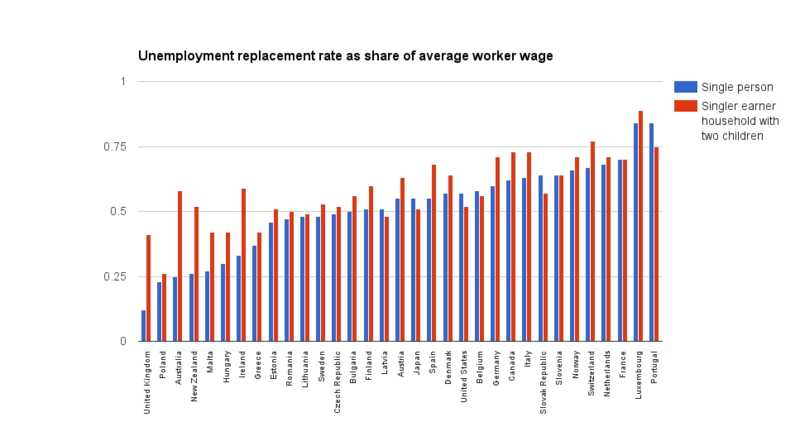 Figure 2 shows how jobseekers’ benefit is set at much lower lowers than in most other European countries. In countries of continental Europe, where the goal of social benefits is not only to preserve a basic safety net for the poor but to maintain middle class incomes in periods of unemployment or sickness, it is much more difficult to retrench benefits because the middle class also benefits from them. This is why you see people taking to the streets in France about every time the government seeks to downsize entitlement or benefit levels. In Britain, cutting them doesn’t cause much of a fuss because those that suffer don’t vote, and the middle class prefers lower taxes to social insurance. Finally, it must be noted that the schemes that benefit the middle class as well, such as pensions and the NHS, were not cut. 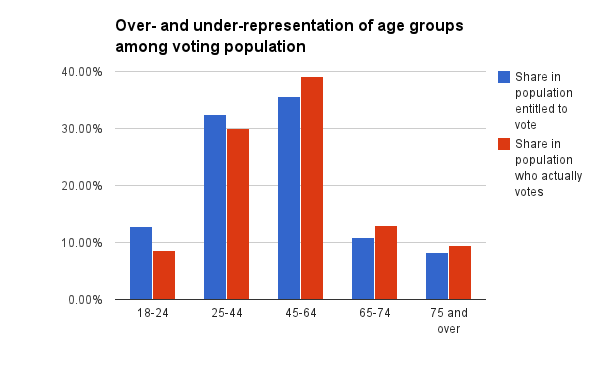 Pension spending was ring-fenced by the government (who was probably aware of the much higher turnout of older voters), while NHS spending is meant to increase in the parliament, probably at the expense of schemes benefitting groups with low turnout. This entry was posted in Austerity, General Election and tagged Austerity on May 14, 2015 by alexandre afonso. Does fiscal austerity strengthen UKIP? In their manifesto published yesterday, the Conservative party have pledged to increase funding for the NHS by 8bn a year, besides other policies that have been criticized for for not being clearly funded. Many observers have argued that all these spending increases will need to be be compensated somehow by deep cuts in other domains, such as the welfare budget, where 12bn are to be cut by 2017-2018. In this respect, the Conservative party will be continuing the policy of reductions in public spending which some believe will lead to levels unseen since the 1930s. Now another thing that the Conservatives want, it’s to prevent the rise of UKIP. Can these two things be reconciled? In the graph above, I have plotted together public spending per capita in 2012-2013 (from here) and UKIP voting intentions from the British Election Study. There is a surprising level of fit (72% of the variance explained), and the clearly negative relationship holds if we control for unemployment (data here: UKIPSpending). The less public spending there is, the more UKIP support there is. Basically, if one were to assume that this relationships was causal, it would “cost” 200 pounds of increased spending per capita to reduce the UKIP vote by 1%. I am not sure whether this fits in the long term economic plan. This entry was posted in Austerity, General Election and tagged general election, UKIP on April 15, 2015 by alexandre afonso. Of course, this view has been criticized by dangerous leftists such as Paul Krugman and Simon Wren-Lewis, who argue that the pain inflicted by austerity reforms could have been avoided if it had been carried out less violently, more slowly, or possibly if Greece had left the Eurozone, through external – rather than internal – devaluation. Now, since the Syriza government has committed to stay in the Eurozone, internal devaluation is the only available option, and prices and wages should go down. The state should be rolled back, the public sector downsized, pensions should be cut, wages should decrease, the labour market should be deregulated. The problem with the reforms favoured by our German friends and the Troika is that they are very difficult to implement in a democratic regime where voters can kick out governments out of power. Indeed, such measures tend to be very unpopular, and governments trying to implement them are bound to face significant electoral losses up to a point where they can no longer rule. This is precisely what happened in most countries of the European periphery, where incumbents at the beginning of the crisis have been systematically voted out of power (e.g Fianna fail in Ireland, the Socialists in Portugal and Spain, Silvio Berlsuconi in Italy, and more recently PASOK and New Democracy in Greece). In Italy, Spain and Greece, anti-austerity or anti-system parties have become leading political forces ahead of established “centrist” parties. The latter have tried to band together in political cartels to implement unpopular austerity reforms, but this strategy has faced severe limits. Indeed, their electoral base has shrunk to a point where they may no longer hold a majority, as happened in Greece. Hence, the main stumbling block impeding Greece from implementing further austerity is a democracy where dissatisfied voters hit by unemployment and falling living standards can vote governments out of power. Karl Polanyi rightly showed that market liberalisations always create a countermovement of protection from society, and citizens badly hit by austerity will turn to political forces that promise to stop the pain, triggering a “countermovement”. 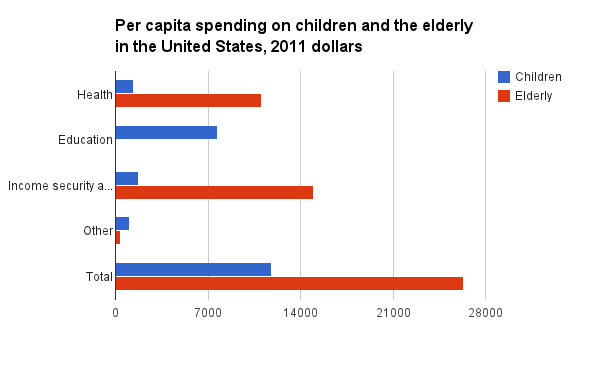 This is why extreme austerity such as that implemented in Greece seems difficult to reconcile with democracy. There is of course a fairly simple solution to this, and that is the establishment of a military junta such as that of Augusto Pinochet in Chile, which has been praised by the likes of Friedrich Hayek and Milton Friedman for the extensiveness of his economic reforms along market lines. Technocratic governments in Greece and Italy were already an attempt to suspend democracy and implement austerity partly in isolation from electoral politics. However, they proved short-lived an fragile. A real military regime would have nothing to fear from unhappy voters bearing the consequences of austerity reforms, and the occasional protest could be easily dealt with through military repression. Pay cuts, which are difficult to achieve in a system with powerful unions, could easily be enforced with military intervention in factories. Portugal’s Salazar, for instance, has a fairly good record in wage restraint during the 1950s and 1960s under state control over unions, and demands observed elsewhere to expand social programs could be swiftly squashed by the political police. It no coincidence that Chile was able to achieve such a level of economic liberalization whereas other countries were wasting time with the consensus-building imposed by democratic institutions. Greece displays a number of favourable conditions for the establishment of such a political regime. First, it has one of the biggest armies in Europe compared to its population, and up to the crisis, had the largest military expenditures as a share of GDP in the European Union. Second, it also has a past of military dictatorship (1967-1974), and the large support received by Golden Dawn in the last elections shows that a sizable share of its population would be confortable with a fascist regime. This creates good conditions for radical methods. These are clearly the only way to overcome opposition to the radical economic reforms that the Troika and Germany wants implemented in Greece. This entry was posted in Austerity, Modest proposal and tagged Austerity, Chile, eurozone crisis, Greece, Pinochet, Southern Europe on February 24, 2015 by alexandre afonso. Put simply, the theory of political business cycles goes like this: in the run up to elections, governments increase public spending or/and lower interest rates (if they can control them) in order to stimulate the economy and reduce unemployment. They supply voters with more goods or cheap credit as a way to make them happy so that they will re-elect them. After the elections, however, governments have to implement drastic austerity to pay for all the goodies they supplied to voters, or increase interest rates to slow down inflation triggered by cheap credit. As a whole, political business cycles can lead to phases of booms and busts, and reduce certainty for investors in a way that is ultimately damageable for the economy. This idea was one of the reasons that led central banks to become independent in most countries. By taking away monetary tools away from governments, one could make sure that they couldn’t use them for electoral purposes. The motto is “research, research, research”. Universities spend significant resources on research and new hires with established track records of publications, partly by “poaching” star researchers who carried out research funded by other institutions. Part of this expansion, however, consists in fixed-term or precarious contracts that can be disposed of after the REF deadline. This touches both research and teaching. As to research, the Times Higher documents a 63% increase in 0.2 FTE (full time equivalent) contracts in the year that preceded the REF, allowing universities to submit the publications of these short-term hires in their REF submission. Universities may have offered such positions to hitherto retired academics or academics based abroad (who are not submitted to the REF by their university) as “visiting” or “research professors” as a way to buy their publications. But this also concerned increasing spending in teaching staff on irregular contracts (teaching assistants; teaching fellows) in order to free universities’ core workforce from part of their teaching duties (seminars of marking) to increase their research output. As a result, student evaluations that are so central to league tables and student enrollments suffer, as students are taught mostly by casual or junior staff. Casual or junior staff are often better and more dedicated teachers, but students may want to actually interact with the renowned researchers at their universities. The motto is “teaching teaching teaching”. Once the REF is over, universities re-focus on teaching as their main source of revenue, especially since it seems that there will be much less money to be distributed than anticipated after BIS blew its budget. The fixed-term teaching and research “industrial reserve army” is disposed of and teaching duties are reallocated to the core academic workforce, who is asked to teach more and mark more. Marina Warner, who resigned from the University of Essex in 2014, reports being enthusiastically encouraged to take part in the jury of the Man Booker prize in the pre-REF phase focused on “impact”, and then being told that she’d eventually have to take unpaid leave in the post-REF phase, where the things that were so praised a few months before were being flushed down the drain. However, much of the new focus on teaching does not translate in more teaching staff, but rather in increased investment in facilities and services. My own university, once the REF was over, set about to carry out a vast downsizing of its school of biomedical sciences and medicine to invest in new buildings. Emblematically, what was a cosy senior common room reserved for staff on the second floor of the King’s building has now been converted into an “informal learning space” for students. This is partly related to the format of the student surveys that have become so central as a way to assess and rank the quality of teaching: a large share of the questions in the survey actually deal with the “service” dimension (staff was accessible; timetable worked; IT resources were appropriate) rather than the actual content of courses. In line with the idea that “unleashing the forces of consumerism is the best single way we’ve got of restoring high academic standards”, student surveys are essentially like consumer surveys. What is assessed is the service that is provided rather than the quality of the content. It is a bit like writing a book or movie review where you’d give equal weight to the solidity of the cover or the comfort of the seats in the cinema as to the actual story being told. This entry was posted in Academia, Austerity and tagged academia, business cycles, research excellence framework on October 19, 2014 by alexandre afonso. Having accumulated a completely unmanageable number of unanswered emails, I had to take the difficult decision to delete all of them. I sincerely apologise for letting you down. If you want me to answer your email, please re-send it to me. I promise that I will try to keep up with emails in the future. The problem with this procedure is that it constitutes what can be called a disorderly default. Imagine that any individual, firm or government could decide overnight that they didn’t need to pay back their debts: it would be chaos. Nobody would lend money to anyone in fear of not getting their money back. Similarly, a disorderly email bankruptcy can have dramatic consequences. Why would I send emails to people if they can decide at any time that they don’t need to reply? With such a level of uncertainty, in the long run nobody will be sending emails to anyone. If you think about it, there is no reason why we should deal with email bankruptcy differently from a “normal” bankruptcy. We need procedures to make sure that people will reply to their emails, while at the same time helping individuals overwhelmed by a mountain of unanswered emails. An obvious solution would be an email backlog restructuring procedure. First, individuals should formally file in a formal request for email bankruptcy (below) to be placed under the protection of the state. You don’t want the enforcers of the people you owe replies to come break your fingers. Second, individuals would be placed under the monitoring of a third party and granted more time to reply to their emails. Bailiffs could come to your house and make sure that you devote all your time to replying to the emails. Alternatively, this third party could reply to the unanswered emails, but in exchange of a drastic email adjustment programme to make sure that insolvent emailers will always reply to their emails in future. Of course, the emails answered by the third party should be paid back with an interest. A central goal of these email adjustment programs would be to teach you not to send tons of emails eliciting replies that you won’t be able to answer, and punish you for profligate emailing behavior. 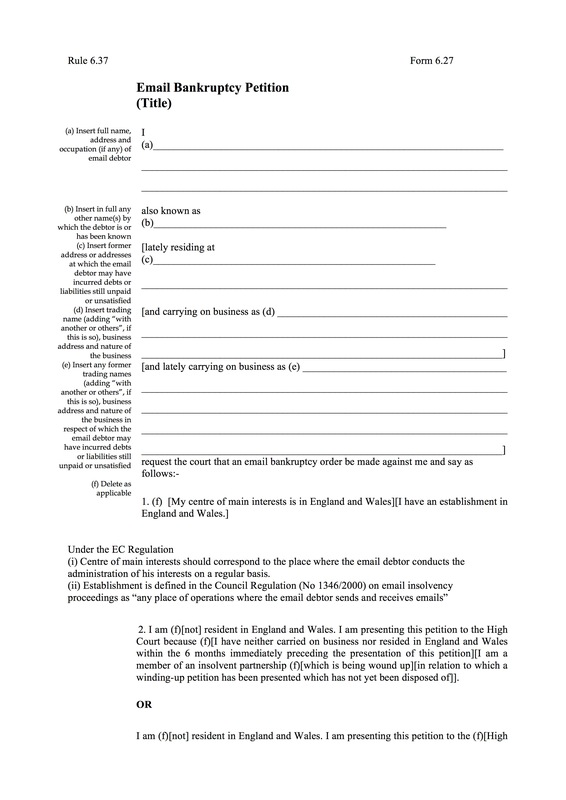 Eventually, in last resort, an email backlog “haircut” can be envisaged in case individuals have to default, but the conditions imposed on the debtor should be even harsher for instance by auctioning their computer material. Even then, this solution would still be less catastrophic than the disorderly email bankruptcies described above. This entry was posted in Academia, Austerity, Uncategorized and tagged Austerity, bankruptcy, debt, email on January 23, 2014 by alexandre afonso.